Kitchen backsplashes, are placed on the kitchen wall between the countertops and the wall cabinets, protecting the walls from staining, especially in the zones close to your sink and stove, the places where you cook, clean, and prepare food. Although the 4-inch natural stone backsplash has been a standard in countertop installations for many years, there’s another eye-catching option to consider a full-height natural stone backsplash. Crafted from matching countertop material, a full backsplash is installed all the way up to the wall cabinets (or sometimes even to the ceiling). It can be installed in an identical pattern as the countertop, creating a sleek and seamless look to your kitchen. 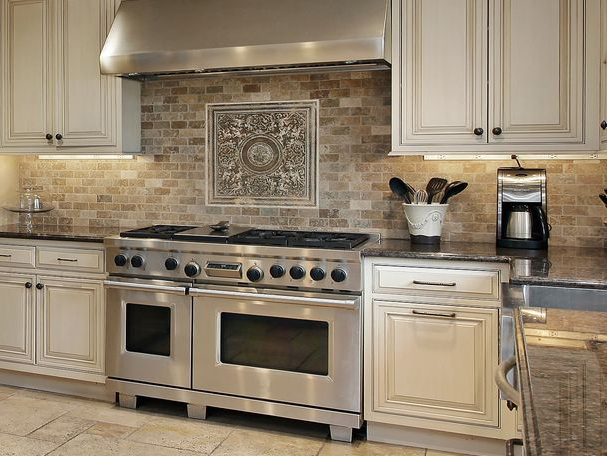 A full-height backsplash is great for cleaning, too — no grout lines! It’s extremely durable, as it possesses the same qualities as your natural stone countertop. Not only can a full-height backsplash act as a compliment to a stunning granite countertop pattern, it’s also a practical barrier to protect your kitchen walls. When viewing a backsplash from a real estate standpoint, using granite backsplash to accompany your granite countertops not only adds visual appeal, but adds to the overall value of your home for future resale. This makes it a personal and practical choice in home decoration!